Ember Inns (Mitchells & Butlers) pub in Chislehurst. It was in the 2007 Good Beer Guide but not the 2008 one. Inside, it's fairly similar to other Ember Inns pubs. The ceiling is fairly low, and some parts of the interior get very little natural light. The space is broken up with interior walls and the seating is arranged in little clusters, providing a measure of privacy. There's some banquette seating and a few sofas. There's some outside seating out the front. Also, out the back there's a fairly large beer garden (some grass, some patio) with lots of picnic tables; the section nearest the pub is covered over, but is clearly intended mainly for people popping out for a quick cigarette, since there are high tables to rest your drink on but no seating. Kake and bob visited on a Sunday Bank Holiday afternoon in August 2009. 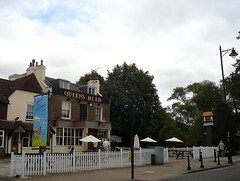 Three real ales were available; Greene King IPA, Adnams Explorer (£2.40/pint), and London Pride. We had the Explorer and it was fine. The place was quite full when we arrived around 2pm, with people of all ages. This may have been partly due to the Bank Holiday. Music was playing very quietly, and mostly inaudible under the many conversations going on. According to a sign seen outside in August 2009, food is served until 9pm every day. The menu is the standard Ember Inns one, covering all of the pub staples. A sign seen outside in August 2009 advertised quiz nights every Tuesday and every Sunday. Accessibility: The front entrance has three steps up (two of them are quite shallow though). There's step-free access via a ramp that runs up from the carpark at the back, and there's also an accessible toilet (the other toilets are up a flight of stairs). Last visited by Kake and bob, 30 August 2009. Opening hours taken from the Ember Inns website, August 2009. Last edited 2013-05-10 07:51:06 (version 10; diff). List all versions. Page last edited 2013-05-10 07:51:06 (version 10).